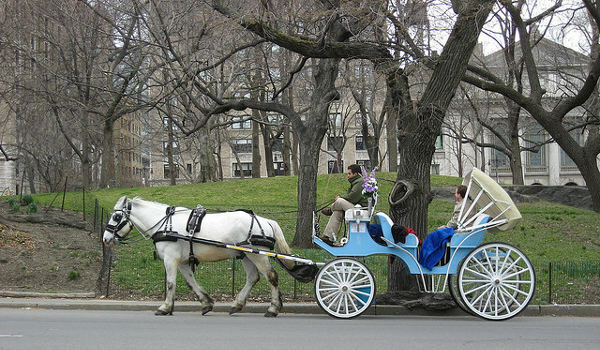 The suffering of horses used to pull carriages in New York City has a chance come to an end. Two recent bills pending in the New York legislature S.5013 and A.7748 would put an end to this cruel practice. The bills, if passed, would ban the use of horses that pull carriages and require humane actions for “spent horses,” preventing their sale to slaughter houses. Introduced May 2011, both of these bills have lingered in the process. With recent publicity, such as the article in the New York Times calling for an end to horse drawn carriages, the bills may be picking up steam. How can you help? You can take action by contacting Carle Heastie, Chair of Cities Committee in the Assembly, and Andrew Lanza, Chair of the Cities Committee in the Senate. The Animal Defense Legal Fund has a petition letter located here.